Jennifer Betit Yen became the President of the Asian American Film Lab, Inc. ("Film Lab"), in March 2012 and relaunched and rebranded what was then a struggling 15-year-old non-profit, creating a large-scale, multi-platform entity devoted to the promotion and support of gender and ethnic diversity in film and television. 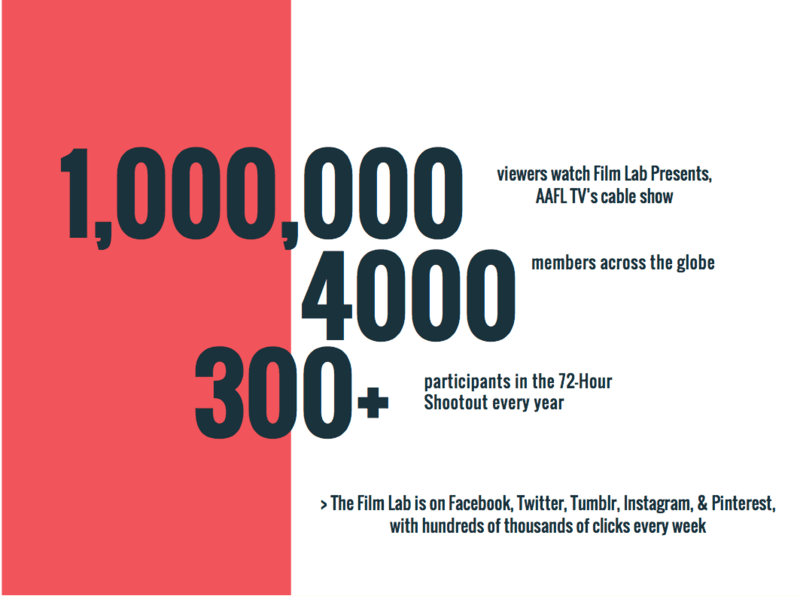 The Film Lab is a 501(c)(3) non-profit providing low or no cost monthly educational and outreach programming, including the acclaimed annual 72 Hour Shootout filmmaking competition. This competition has inspired hundreds of filmmakers by helping nascent talent take brave steps towards a filmmaking career. Past Shootout judges include hip hop icon Russell Simmons, producer Teddy Zee, and ABC Primetime Casting Director Marci Phillips. The Film Lab was formed in 1998 by collaborative of New York-based filmmakers whose goals were to hone their craft and to share their knowledge, experience and resources. The membership has grown to comprise professionals, artists and other talented individuals who all share the common goal of creating great film and promoting all filmmakers of color, with a focus on Asian Americans, and the visibility of their stories and characters in film and television. The Film Lab is run under the direction of President Jennifer Betit Yen. Acting and Advisory Board members include Aaron Woolfolk and James Kyson. Departments include Unfinished Works (a workshopping and reading program for writers, actors and directors); Industry Spotlight (educational seminars, Q&As and screenings); the 72 Hour Shootout; Connections (networking events for artists of color); and AAFL TV, the Film Lab's new production arm, a brainchild of Jennifer Betit Yen. A creation of Jennifer Betit Yen, AAFL TV resulted from the August 2012 launch of a production arm of the Film Lab, focused on the creation of contemporary, diverse, innovative, and original entertainment content. 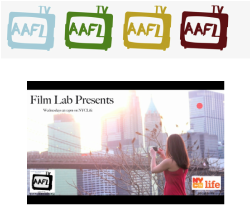 With the launch of its first pilot series on September 30, 2013, AAFL TV became an essential destination for those looking for innovative, original entertainment that accurately reflects the diverse demographics of US society. ​The first TV series, Film Lab Presents, has aired for over 8 seasons with views ranging from 100,00 to 1.1. million per episode. The first film, a SAG-AFTRA short, The Opposite of a Fairy Tale, previewed at MOCA, the 39th Asian American International Film Festival, the SAG-AFTRA NY Shorts Showcase, Palm Springs, Desert Film Society, and at HBO. It is now available on iTunes. AAFL TV includes a wide array of short films made under the auspices of the Film Lab’s acclaimed annual 72 Hour Shootout (“Shootout”) filmmaking competition. These short films showcase stories focused on Asian Americans and other Americans of color and range from comedy to drama to mystery and everything in between. Noticing an explosion of interest in diverse, original creative content based on the Shootout and a corresponding rising level of dissatisfaction with some mainstream programming for a lack of diversity and/or perpetuation of racial stereotypes, Jennifer became the driving force behind the Film Lab's launch of AAFL TV to provide contemporary, original content by, for and about diverse Americans – content that not only entertains, but also accurately reflects the diversity of the United States, both in front of and behind the camera. AAFL TV has been featured in AsAmNews, the Examiner, OpEd News, the South Asian Times, and more. Originally developed as a learning tool to incentivize reluctant readers ages 3-10 through personalization and multi-media formats, MyJennyBooks quickly became a gift of choice for new and expecting parents and for little ones who wanted to have books that didn't just feature their names, but were actually adventures about them! Jennifer Betit Yen, along with her husband, launched MyJennyBook in July 2012 to help open the wonderful world of books to all children, especially those who might initially experience difficulty learning to read. MyJennyBook quickly became the #1 Google hit for personalized multi-media stories for children. MyJennyBooks have been featured at the Mixed Roots Festival in Los Angeles, California (celebrating diversity), the USA Science and Engineering Festival in Washington, D.C., (a fun MyJennyBook celebrating science is the My Robot JennyBook, in which a child builds a robot and shares it with classmates) and the Brooklyn Children's Museum in Brooklyn, New York (the MyJennyBook Mermaid Adventure). The MyJennyBook "Saving Tooth Fairy from the Sugar Bugs" story is an official Heads Up! Pediatric Literacy selection. Also featured in the 2015 Holiday Gift Guide by Cornell Alumni Magazine. The MyJennyBook website, Facebook page and Twitter feed all offer daily literacy building tips and activities for children. If you would like a catalogue, more information or if you have ideas for schools, teachers or literacy programs you think might benefit from MyJennyBook, please do not hesitate to contact us. We look forward to hearing from you. You can email us at info@myjennybook.com.